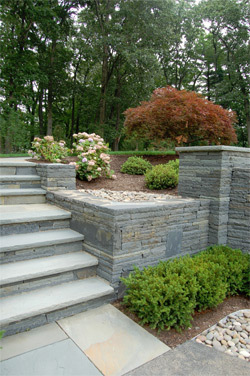 Smart Landscapes that are Beautiful, Maintenance Friendly & Green. You are probably thinking that anyone can put the word SMART in front of what they do and it will sound modern and sophisticated. That may be true, but at Peak Environmental, SMART LANDSCAPES is our promise to you! What exactly does SMART Landscapes mean? At Peak, a SMART Landscape simply refers the quality of the design, the presence of a well planned maintenance strategy, and how well the landscapes features are functioning with the surrounding environment. *Beautiful: Our designers will develop landscape features for your property that are of the highest level of functionality and workmanship. *Maintenance Friendly: A proposal for annual maintenance will be provided during the design process. Ideas to lower maintenance cost for your property will be developed and presented. *Green: This means that landscape must be a benefit to the environment, this refers to its use of resources as well as its overall benefit to the natural world that surrounds it. Whether you are building a new home, a commercial property, or you have an existing landscape that is not that smart, we can help! Our promise to you is a landscape that is beautiful, maintenance friendly and green. *We promise our work will be completed for the price that was quoted. *We promise to show up when we say we will. *We promise to keep you AND our employees safe at all times. * We promise that your calls will be returned within 1 business day.